Highest Kick Serve Ever? Check out this video, I found it when I was browsing around on youtube the other day. This guy has one hell of a kick on this serve… the ball looks to kick up about 7-8 feet! But is it real? I mean, I know it’s actually real, but do you think this ball had a little help maybe by hitting a “bouncy” spot on the court, or do you think this is a normal for all of his serves? Personally, I think the ball may have had a little help, but I’m not sure since it only shows 1 serve. Let me know what you think in the comments section below: Do you think this is the guy’s normal serve, or do you think the ball had a little help? Crushing Serves at 100+ mph is easy if we have the strength, the power, and the technique to pull it off. For advanced club players, there is only so much we can do to work on technique to add extra pop to our serve – short of breaking down a video analysis of our serving motion. Once we get to a certain level, improving our game becomes a matter of inches where we have to fine tune several small parts of our game to see a big improvement. When it comes to serving, there are 2 main components to hitting a bone crushing serve: our ball toss & our strength and power. The ball toss tweak is fairly simple. When I want to really smoke a serve, I just simply toss the ball further out into the court. By doing this we’re forced to lean into the ball in order to reach the proper contact point for it to go in. This creates huge leverage and gives us the momentum to literally crush it. 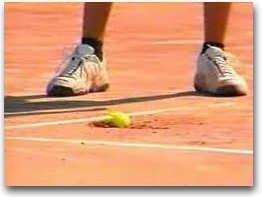 It may take a little practice to find the exact contact point if we’re not used to tossing the ball into the court. Timing is the KEY. If your timing is off by a millisecond the ball will either sail out or v-line straight into the net. 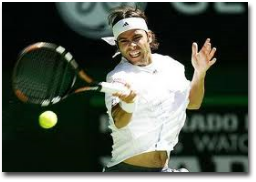 Developing strength and power is a little more tricky, because it’s not just a single muscle group that has to be trained, but several… and they need to be able to work together to generate massive racquet head speed at contact. With precise training, you can add 1-2 mph on your serve in a matter of weeks. 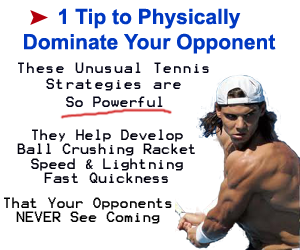 I have a Tennis Workout designed specifically to target your serve, and you can have it for FREE. Plus you’ll get a FULL BLOWN Serving Workout that you can start using right now that’s designed to help you generate TONS of power & Spin to blast serves by your opponent regardless if it’s your 1st or 2nd serve! This is all on the next page. til Next Time, Train Hard & Win Easy! I found this cool video on youtube and thought you might like it, because Jeff, through one of his students, demonstrates a common mistake most folks make during the serving motion and how to fix it. Plus, he gives you a unique drill to help you hit more powerful & consistent serves in just a few days time. ’til next Time, Train Hard & Win Easy! Todd Scott, Training Advisor, Men’s Fitness magazine & Creator of the Tennis Matrix Conditioning & Training program. Thanks so much for leaving a comment the other day about which forehand grip is your favorite. We’ve got over 55 comments so far, and some good questions to go along with it. So, as promised, I’m going to film a strategy video that helped my buddy learn to CRUSH the ball. It’s a bit gloomy and rainy right now, so I’ll get that filmed for you in the next few days as soon as the weather clears up. The only catch is that it is VERY time sensitive. Since I ONLY have 10 new roster spots available in the Tennis Protégé Club, we are now accepting new applications. And since there are only 10 new spots available, I’m only accepting applications for the next few days. This is something I’ve been working on since August, but it’s NOT for everyone. Plus I’ve got a goofy pic for you that we took one night while we were at the State Tennis Tournaments down on the gulf coast. P.S. Don’t forget, due to the time intensive application review process, I can only accept applications for the next few days, so go ahead and get yours in. They’re reviewed on a first come first served basis. What’s Your Favorite Tennis Forehand Grip to Use? What’s your favorite forehand grip to use? So, if I get at least 30 responses, I’ll make a video showing what changes we made so that you can add another weapon to your game. Just leave a quick comment below about which forehand grip is your favorite to use. Growing up I got tired of my little dinky serve (I was young like 12-13 or something playing as an alternate on my high school tennis team), so I started reading Tennis magazine relentlessly trying to find tips and tricks to help me out. Then one day they happened to publish step by step instructions on how to properly hit the Kick Serve. I really had no idea the effect it would have on my game over the following years (and now into my adult life). It wasn’t something that I learned overnight, but after working at it for a while I slowly mastered it… and today… I’m fortunate enough to be able to say I have it totally mastered. Being at just the 3.5 level, my opponents RARELY face anyone that has both power and a head splitting kick to their serves. So when they’re returning (or trying to return I should say), they look like a deer in headlights. It spins away from them, and then at the bounce kicks towards their head – so they have no idea what to do except freeze in their tracks and duck. And 2 sets is HARDLY enough time for the most athletic recreational player to learn and adjust, because of the variations of spins I’m able to put on the ball. One serve it may kick across their body… the next serve it may kick into their chest… the next serve may not even kick at all. This is mainly dependent upon how fast we whip through the ball. The angle of the spin is easy. But the degree & the RPM’s you put on it can make all the difference in the world when trying to keep your opponents off balance. 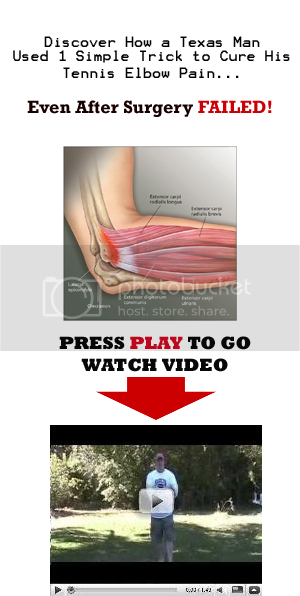 There are 2 main things that we need to focus on to generate tons of spin… Leg Strength (explosion) and Explosiveness in our Triceps (arms). Now, if you currently use the Kickserve as one of your weapons, you’ll find that using this exercise in your workouts will greatly increase the speed at which you CAN whip through the ball. I stress the word can because it’s not always necessary to put a ton of spin on the ball – especially if you’re trying to keep your opponents off guard. But it will allow you to when you need to or just want to kick the ball across their body for the fun of it. And if you don’t currently use the kickserve, I highly suggest you learn. You can find instructions at Tennis.com (you’ll have to search around and see if you can find an article with instructions), or you can learn through Coach Kyril’s video lessons inside the Tennis Vault. Either way, you won’t be sorry. I promise. P.S. 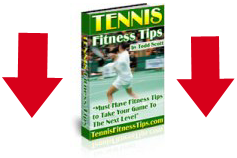 If you don’t have a copy of the Ultimate Tennis Fitness program, this tennis training guide is everything you need to physically dominate your opponents from the first toss to the last point. Have you ever tried to serve by ONLY using your upper body? I tried this last week during a singles practice match and felt like threw my shoulder into the friggin net. People who believe they don’t need leg strength for a serve are normally the ones that have a crappy serve anyway. So don’t take their advice… because generating power :: Explosive Power :: Is EXTREMELY important in pounding ferocious serves your opponent can’t return. If you could improve just 1 part of your game and have it be as strong as that of your favorite pro, which would it be? Just click the comments section below, and leave your answer. You can make your answers as long or as short as you like. Going out to the courts and pounding serves for hours on end is one way to improve your serve. But if you want to go the extra mile and not only develop your placement, but also increase the power of your serves – then you’ve gotta do what none of your opponents are willing to do. Add this superset into your program, and you will see a noticable difference in the power of your serve! P.S. Don’t forget to click the “Like” Button Below to tell all your tennis friends. p.s. – more videos will be uploaded soon, but if you want a fast track to tennis dominance, go check out http://TennisFitnessTips.com/MatrixII <== Complete workouts that will allow you to physically dominate your opponents. Tennis Training – They’ve Got it All Wrong? Conditioning for Tennis can get confusing. Over the years it’s been passed downby”gurus” that long slow conditioning is the best thing to do to improve speed, agility, and overall oncourt conditioning performance. Tennis is a game of short intense bursts of speed and power. Sure, you’ll need “stamina”, but not the type of stamina 3-5 mile runs will give you. Take a sprinter, for example. They don’t train for speed by hopping out on the road or on a track and running miles and miles at a time. A sprinter trains in short sprints of 10-200 meters at a time. They Train for their sport. It wouldn’t make sense for them to run for long distance, because it’ll train their muscles for getting really good at running miles and miles at a time. The same holds true for long distance runners. They don’t practice sprinting, they practice long distance running. If their next meet is a 26 1/2 mile marathon, they’ll train by running 30-50 miles at a time. Because it trains their muscles to endure long periods at a time of slow steady running. Since tennis is a sport of short intense bursts, the best thing for tennis conditioning is interval training. Practice short bursts with little rests, and you’ll see improvement on the courts almost immediately. It’ll help you not only catch your breath faster, but you’ll be more in tune and able to focus on each point one at a time. Your mind won’t be on the pain, it’ll be on hitting your next Winner!! If you don’t have a place to perform interval training for your tennis conditioning, the Tennis Matrix programs were designed for this very purpose. In fact, many tennis fans have written in about how the Tennis Matrix has dramatically improved their game and allowed them to beat players they’ve never beaten before because now they can focus on their technique and strategy during a match as opposed to focusing on Catching their breath. It’s amazing what a little bit of tennis specific conditioning for tennis can do.